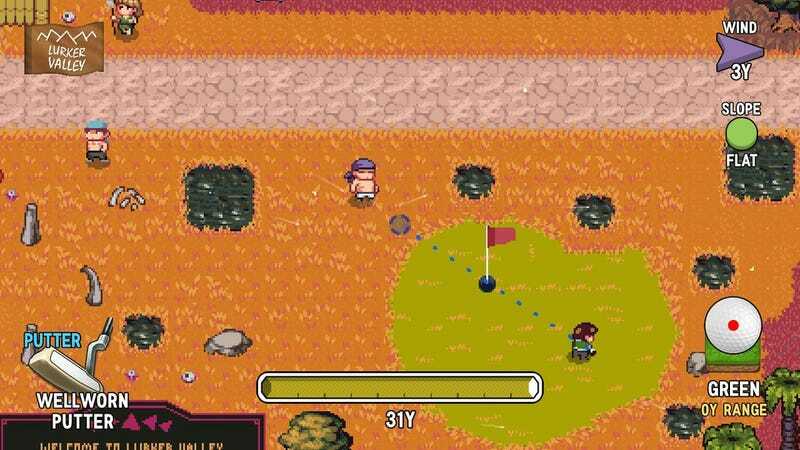 Golf Story is a very charming golf themed RPG for the Switch, but it kinda throws you into the game without telling you a lot about how to play it. If you’ve had trouble sinking a hole-in-one, these tips will probably help you. At any point you can hit - on the left JoyCon to see the controls, and they’ll change depending on whether you’re teeing up a shot. They aren’t very detailed, but they’re good for a quick reference when you’re confused. When you’re teed up, you can make some large scale adjustments to your shot very easily. If you press up or down on the analog stick, you’ll change what club you’re using, and thusly how far you’re going to hit the ball. If you press left or right, you’ll change where the ball will land on the green. If that’s not getting the ball where you need, you can also try pressing the trigger buttons, which will shorten the maximum length of your shot. Pressing ZL will give you what’s called a “short approach.” In non-golf words, that’s an arcing shot that’s not all that far away. ZR will also give you a shorter approach, but it’s a bit longer than pressing ZR. This changes for putting. ZL will still shorten your shot, but ZR will actually make it longer when you’re trying to putt. There’s two arrows in the right hand corner of the screen that will tell you the wind, and when you’re putting, the slope of the ground. There’s no other indication on screen of these two things, so make sure to look at them when you’re lining up your shots. The wind will affect your ball while it’s in the air. If the wind is pointing slightly to the left, adjust your shot to be slightly to the right of where you want it. Accounting for slope is a lot harder because the arrow is the only indication of what the slope is, if there is one. The arrow will give you a word describing how strong the slope is as well as the direction of the slope. If the arrow is pointing to the left, and the descriptor they’re using says “slight,” that means your ball will probably curve left as you’re putting. It would be easier if there was something to help you visualize what the slope looks like, but speaking generally, you should adjust your putt away from the curve when you can. If you hit Y while you’re teeing up, you’ll enter precision mode. This will allow you refine the distance of your shot by pressing up and down on the analog stick. You’ll see a shadow of the more precise shot you chose in your shot arc, and on the meter at the bottom of the screen. If you look at the picture above, you’ll see that it’s the second marker you’ll be aiming to hit so that the ball goes where you placed it in precision mode. I really like using this while putting, to make sure that I’m not hitting the ball too powerfully and overshooting the hole. If you hit X while teeing up a shot, you can change at what point you strike the ball, giving it a spin in the air. If you move the analog stick left or right, you’ll be able to see how you’re changing your shot arc. This is useful if you want to maneuver your ball around obstacles. If you need even more spin, hit the left shoulder button to add forward spin when the ball hits the ground, or the right shoulder button to add spin backwards. Forward spin gives the ball a boost forward on the ground, backward spin will slow it down (or move it backward when you’ve leveled up your Spin stat enough). These controls you might not use all the time, but it’s better to know them than need to use them and not know how. You can, and should, tee up anywhere in the world by pressing Y. Not only is this a great way to work on hitting the markers on the meter or playing with spin, there’s also some secrets around the map that you’ll be able to hit some golf balls into. Have fun exploring! It’s the golden rule of RPGs, but it really matters here. Golf Story is a little opaque, but the people you talk to can offer tips, challenges and hints on how to progress the story. While the golfing in this game is really fun, it’s an RPG at heart. Exploration is key, as the only way you’ll level up in a timely manner is by finding new characters to give you more things to do. In a game this weird and charming, you might as well enjoy your stay.